The drone is modelled on a whale shark. The WasteShark is modeled after the whale shark, the largest fish in the world. It’s a “filter feeder,” meaning it gobbles up plankton and small crustaceans without moving much at all — prey is simply sucked into its long, flat mouth. The WasteShark operates just like this ocean predator. But in this case, the prey is plastic bottles, not plankton. Capable of swimming for up to 16 hours, the WasteShark scans its immediate environment as it works, collecting data to send back to its central command. It can test the waters for pH levels, conductivity, ammonium, chloride, nitrate, salinity, and many other metrics. Hardiman says the idea came to him one day when he was playing hooky from work. He grabbed a coffee along the Cape Town waterfront and saw two men trying to scoop plastic out of the water — and having a very hard time doing this, since it was windy and the tide was going out. The WasteShark can be steered manually via remote control or through a plotted map on an iPad. It’s best suited for harbors, rivers, and canals — so-called “waste chokeholds” that RanMarine Technology has identified based on weather patterns, shipping and wind movements, and the tides. 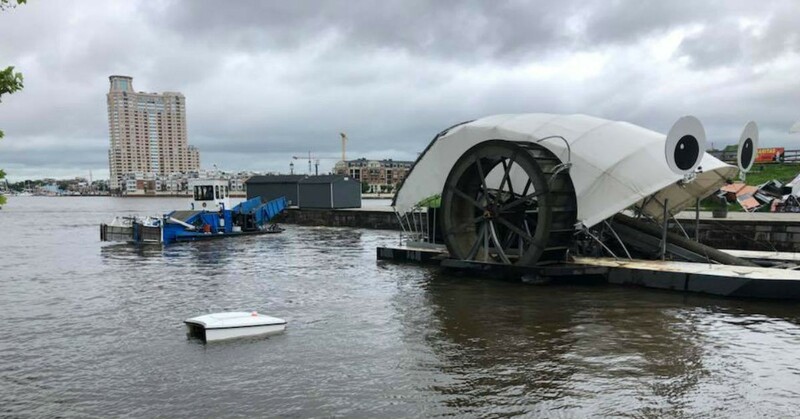 The company has already deployed the aquadrone locally in the Port of Rotterdam and brought it stateside to the Baltimore Harbor, where the WasteShark swam alongside Mr. Trash Wheel. RanMarine Technology says the drone doesn’t harm fish, which generally swim away from it as they do with sailboats. Birds also tend to avoid it. Although the WasteShark does not operate in major shipping lanes, it is visible to shipping traffic, per maritime law. RanMarine Technology does not have plans to take the WasteShark out in the open oceans. The company believes that by vacuuming up trash at ports and harbors, it can stop plastic pollution at the source, wiping out floating debris before it drifts down into the oceans.